Martin Limbeck is an international sales authority and sought-after keynote speaker, dubbed “The Porsche of Sales” by the press. With his best in-class German Sales Engineering approach, he helps sales professionals seal more deals. He is charismatic. His presence, his clear positioning, his direct speaking style—this is what sets him apart from many self-proclaimed sales experts in the industry. This sales professional knows exactly what it takes to close deals and does not mince his words in his presentations or his training seminars. And Martin Limbeck has a lasting impact. He stands for a targeted tuning of the sales and management teams and processes. His presentation and training style is his trademark: clear, direct, provocative, polarizing, and motivational. He kicked off his sales career in printers and photocopiers: In other words, Limbeck began where the going was tough, where the mileage was hard-won, and where there were far more doors shut in your face than held open for you. Where others gave up or chose between a way out or a way around, Limbeck moved straight ahead. But before lead could turn to gold, and the dues he paid became a well-earned commission, he had to roll with the punches and learn from defeats. For the sales luminary that is Martin Limbeck, “No” does not mean “No”, it means “Next Opportunity.” And this is not merely something he says. He lives by it. “In the long run, diligence always trumps talent.” This motto, too, belongs to this top speaker and has become a credo for many sales professionals. 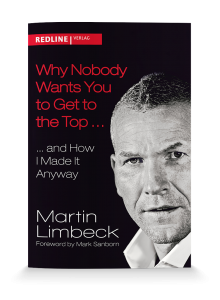 The fact that Martin Limbeck has since become a role model is attested by his presence in the media. Countless newspapers and magazines have covered him. Radio and television view him as an eloquent figure who does not mince words and speaks plainly, where others do all they can to avoid such candor. Appearances on talk shows are a testament to Martin Limbeck’s prominence. More than 100,000 fans, friends, followers, and subscribers on social media like Facebook, Twitter, YouTube & Co. have made him a social media phenomenon and one of the most wide-reaching experts in his field. Martin Limbeck is a Professional Member of the Global Speakers Federation, as well as part of the TOP 100 MEMBERS of Speakers Excellence. The founder and managing partner of the Martin Limbeck Training Group is also a co-founder of SALESLEADERS, an association of leading sales experts in the German-speaking sales world, and a sought-after expert in the media, whenever the subject concerns closing-oriented selling. The Certfied Speaking Professional (CSP) was the first German to speak at the National Speakers Association’s convention in the U.S.A. He has been honored as Top Speaker of the Year 2014, International Speaker of the Year 2012, and Trainer of the Year 2011 and 2008, and was presented with the meeting and event industry’s Conga Award in 2010 and 2009. The list of his successes and distinctions is extensive and reflects the profound impact he has had in the world of sales.